The Barnstormers were unable to continue their winning streak as they lost to their division rivals, the Kansas City Command, 62-48. The Command took the early lead and controlled the game for most of the way, but the Barnstormers rallied from what was a 15-point deficit to tie the game at 41-41 in the fourth quarter. However a costly turnover on special teams put the Barnstormers down by two scores with 3 minutes remaining and was too much to overcome. Kansas City collected their first victory of the season improving to 1-3, while the Barnstormers fell to 2-2 on the season. 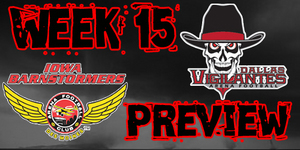 The Iowa Barnstormers (2-2) will suit up against another conference rival and former Barnstormer Jason Simpson this week versus the Chicago Rush (3-1), for their fifth game of the 2011 season. Following up on a fairly successful season last year, the Rush are currently ranked first in the National Conference, Central Division while the Barnstormers have dropped to third. Jason Simpson currently leads the Rush in interceptions with 4 and is third in returning yards with 233, averaging 58.2 yards per game. Although both teams are coming off a game four loss, this will no doubt be a high intensity game and a battle to the end. The Chicago Rush were on the road last week in a non-conference match up against the Cleveland Gladiators (3-0). Currently ranked first in the American Conference, East Division, the Gladiators showed no mercy on the Rush as they took control of the game, winning 55-48 in regulation play. The Gladiators were the first team on the board four minutes into the game and although the Rush were able to hang on throughout the first quarter, Cleveland took charge in the second and never allowed Chicago to regain the lead. This marked the first loss for the Chicago Rush this season. Iowa Barnstormers vs. Chicago Rush will be broadcast LIVE Mediacom Connections Channel 22, on 1700 AM The Champ and on the Internet at www.theiowabarnstormers.com or at www.nifty-tv.com. -This will be the third meeting between the Chicago Rush and the Iowa Barnstormers. The Rush lead the series 2-0. For the second week in a row, the Barnstormer defense has displayed their finesse on the field as Defensive Back Cameron McGlenn is awarded the Barnstormer Player of the Week. At the beginning of the third quarter McGlenn intercepted a pass thrown by Command’s J.J. Raterink, returning the ball for 19 yards. This play led Iowa to a touchdown, putting them ahead 24-20. Cameron also led the team in tackles, posting a total of 9 to his stats.